A Workhorse Of The Industry, This Janitor'S Cart Is Designed To Accommodate And Organize Tools And Supplies Required By Today'S Facilities Managers. Oversized Wheels And Casters Make It The Choice For Heavy-Duty Applications In Healthcare, Airports, Convention Centers, Office Buildings And More. Zippered Vinyl Bag Is Included. 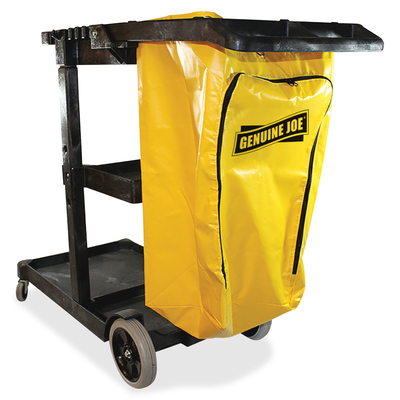 Use With Genuine Joe 60466 Bucket-Wringer Combo..
A Workhorse Of The Industry, This Janitor'S Cart Is Designed To Accommodate And Organize Tools And Supplies Required By Today'S Facilities Managers. Oversized Wheels And Casters Make It The Choice For Heavy-Duty Applications In Healthcare, Airports, Convention Centers, Office Buildings And More. Zippered Vinyl Bag Is Included. Use With Genuine Joe 60466 Bucket-Wringer Combo.